Photo: Danielle Chestnut will walk across the stage on Friday night at Wallace State, graduating with an Associate in Science degree. In the stands will be about 10 nurses she’s kept in touch with since she was 11 years old and who treated her as she went through chemotherapy for non-Hodgkin’s lymphoma. HANCEVILLE – Danielle Chestnut will have a special set of folks rooting for her as she accepts her diploma on Friday night at Wallace State. The Holly Pond graduate who survived cancer when she was 11 years old will have about 10 of her former nurses in the stands. 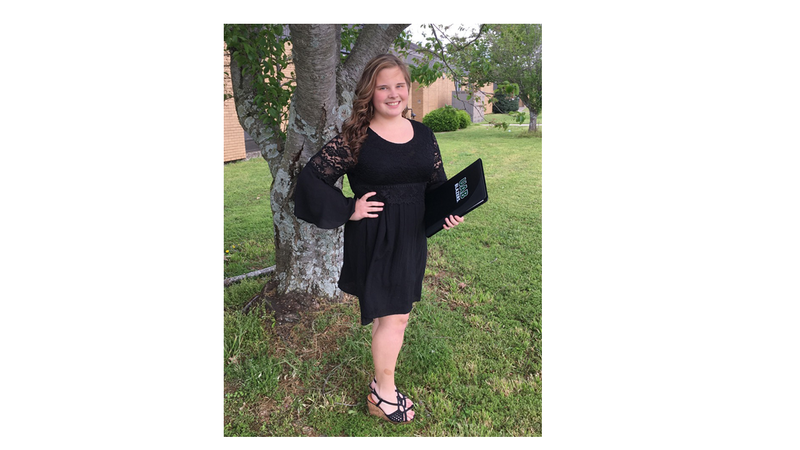 Chestnut is earning her Associate in Science degree as a student in the joint admission program with the University of Alabama at Birmingham, where she will transfer to earn a degree in nursing. From there she plans to study to be a nurse practitioner in oncology/pediatrics. It’s those nurses in the stands who influenced Chestnut’s career choice after she experienced first-hand their care as a child. “What stood out to me from all of them was their love, passion and support and the encouragement that they gave me throughout the entire time,” she said. Chestnut, who now lives in Fultondale, said she was diagnosed with non-Hodgkin’s lymphoma after going to the hospital because she was having trouble breathing. What was presumed to be pneumonia was actually cancer when test results showed a softball-size tumor mostly in her chest, but also in her legs and in her lymph nodes. “The tumor was pushing into my airway and I only had one-quarter of an inch to breathe,” she said. For the next six months, Chestnut took chemotherapy treatments at least once a week. “It turned my life upside down,” she said. She lost her hair, the treatments left her nauseated and it was a lot for a little girl to take, especially when she didn’t really know what was going on at the time. The worst part, she said, was not being able to go to school and missing out on events. She was out of school for a year and a half, but home-schooled to keep up with her studies. Chestnut, 21, said she’s been in remission now for about eight or nine years. She lives independently and works part-time at Wallace State as an intern in the Advancement Office. Along with her school work and her job, Chestnut is an SLA math tutor, and a member of the Pi Theta Kappa honor society serving as its vice president of fellowship, is the secretary of the Sigma Kappa Delta English honor society, is treasurer of the Student Government Association, and is a member of the Mu Alpa Theta math honor society and the Wallace State Alumni Association. She’s been awarded a UAB Phi Theta Kappa transfer scholarship and a joint admission scholarship to UAB. She is also a nominee for the Jack Kent Cook Scholarship. Along with many outstanding faculty and staff, one person who’s been an inspiration to her at Wallace State is Suzanne Harbin, director of advancement at Wallace State. "She is someone who has encouraged, supported, and loved me from day one,” Chestnut said. “I have found passion, leadership, and a family. She succeeds at everything she does and handles things very well. These characteristics alone not only make her into the person she is today, but also the person I hope to be in the future. Her outstanding qualities have molded me into a real leader. I myself have faced my own personal trials through life, but Mrs. Harbin has played a positive role that will influence me the rest of my life. She taught me to never give up on my dreams." The Joint Admission program with UAB is available to freshman students who have earned less than 24 credit hours at Wallace State and have not attended any other college. Through the program, students have scholarship opportunities, access to UAB facilities and are able to meet with an on-campus UAB representative to guide the transfer process. Contact Brittany Quinn at bhquinn@uab.eud or 205-623-9050 for more information. Wallace State will celebrate commencement on Friday, May 13, at 6 p.m. in Tom Drake Coliseum. The public is invited to attend. For more information, visit www.wallacestate.edu.